I've discussed car ladders a couple of times on this blog. If you've been paying attention, you'll have noticed that I've been rumbling about doing something. Well here it is. I'm now retailing etched ladder stiles in 4 styles. I've always been frustrated with plastic car ladders. Flash to clean off. Rungs that break when desprueing. Oversize rung diameters. These ladder stiles are photo-etched brass and are available in 4 rung spacings. The stiles are pierced for 0.012" wire grabs if you use Tichy grabs you may have to ream out the holes a tad, since Tichy uses 0.0125" wire for their grabs. The parts are easy to use. Cut the stiles from the fret and either using a tool like "Etch-Mate" or a steel ruler and a single edge razor blade, fold the stiles into an angle. Use either commercial straight grabs or form your own for the rungs. Now you can easily use 0.010" or 0.008" wire if you desire for a more scale appearance. Cut the legs of the grab very short and insert in the holes. Secure with CA or solder. Small tabs of styrene inside the angle can be used to create standoffs. I'm also releasing etched eyebolts in 2 styles. The commercial bent wire eyebolts have always been oversize. By photoetching we can reduce the size to a far more prototype appearance. We offer 2 frets of eyebolts with a mix of sizes to serve all your needs. The photos show the parts with a piece of 0.010" wire so you can get a real sense of small these items are. But since they're phosphor bronze they are robust. All of these items will be listed on the Yarmouth Model Works website within the week. All items are $3.00 ea, plus mailing costs. Which will vary according to amount ordered. I will have these items on display in Naperville for the Railroad Prototype Modelers meet, Oct 18-20. I will be presenting a clinc that week as well as selling in the sales room on the Saturday. Maybe we'll see you there. I actually enjoy building stock cars. Here's 3 more Sunshine stock car kits. ATSF SK-R, SK-T and SK-U. Really nice pattern work from Charlie Slater. Through these cars you can see the progression of the end design as the railroad worked at making it easier and safer for the crews to access the end doors to inspect the loads. I had a nice time building these cars and they all have my usual level of detail upgrades. Full underbody rigging and plumbing including brake rod clevis. So as a result of the work we're doing on the next Yarmouth Model Works release, which I won't tell you what it is yet, I found myself in need of a couple of good views of the underside of a Canadian built 1937 AAR boxcar. An online inquiry suggested that there were 2 in downtown Toronto as part of a grape wholesaler. So I grabbed the camera and the GPS and headed for the Big Smoke. 21/2 hours later I arrived at the desired location only to find that progress has taken it's toll. Where the cars should have been, was a condo/apartment block under construction. However slightly south of that location was a pair of boxcars, but not the ones I was looking for. These had plug doors, which for me, made them newer than what I was looking for. As well as I couldn't get to the underframe due to all the stuff that was surrounding the cars. As I was looking at these 2 cars and getting the hairy eyeball from the dock foreman, I noticed a lone 40' boxcar with a 6' door across the right of way. Maybe it wasn't a wasted trip after all. I jumped in the van, whipped under the underpass and found myself at a semi-abandoned warehouse with a concrete loading dock. As I approached the car and looked at the details I knew I had found what I was looking for. Stirrup attached to ladder. Check. 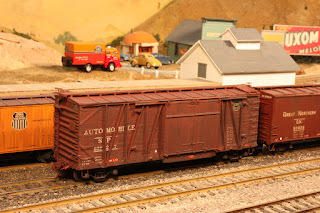 Canadian built 40' AAR boxcar. I jumped down and pushed through the trees to get at the underframe. The point of the exercise was to confirm the shape of the cross ties, cross bearers and the attachment of the reservoir. As I crouched down and prepared to photograph the details I realized that under this car was someone's home, as well as another couple of sleeping bags under the loading dock. It was mid-day and none of these residents were in sight, but the moment went from elation of discovery to distinct discomfort. I truly felt that I was intruding in someone else's space. I quickly took the pictures I needed and got out of there. For much of the drive home I reflected on the clash of these 2 distinct realities. Me with the leisure time and where with all to look at and model 50 year old boxcars and those poor souls, who for whatever reasons use the same item as a roof. Ya, we're indeed lucky. And I'm not going to forget it for sometime. Nice one Ted! Actually credit goes to Bill. Since I first wrote this post, I've been informed that the actual roof patterns were created by my friend Bill Welch. I'm a big proponent of credit where credit is due, so I apologize to Bill for the error. I know that Bill is working on some other neat projects and once they are ready, I'll let you know about them. If they're half as good as the roof patterns, we're in for a treat. I just completed these 4 NYC stock cars for a client. They are Westerfield kits with a difference. 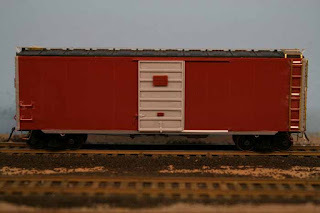 The roofs on these models are not the kit provided roofs, but rather a roof created by Ted Culotta of Speedwitch Media. They represent a reroof done by NYC done in the 40s, I believe. Interesting that the railway went from a metal roof to a wood sheathing. There's a conversation I would have like to have heard. The pattern Ted created for this roof is nothing short of spectacular. Just the right level of variance in the individual boards to make it look believable without being overdone. Too many people over-weather wood structures to the point that in real life they'd be falling down. For a variety of reasons Ted has scaled back some of his Speedwitch activity, but his items can be found on Ebay from time to time. Well worth searching out. So a little post script. I found the prototype data sheet and it states that the cars were reroofed in the late 40s and 50s as required. There are times when my interests and my clients desires come together. This Speedwitch Media kit, #K118, is a SP A-50-4. The history provided in the kit instructions suggest that the prototype wasn't upgraded with AB brakes. 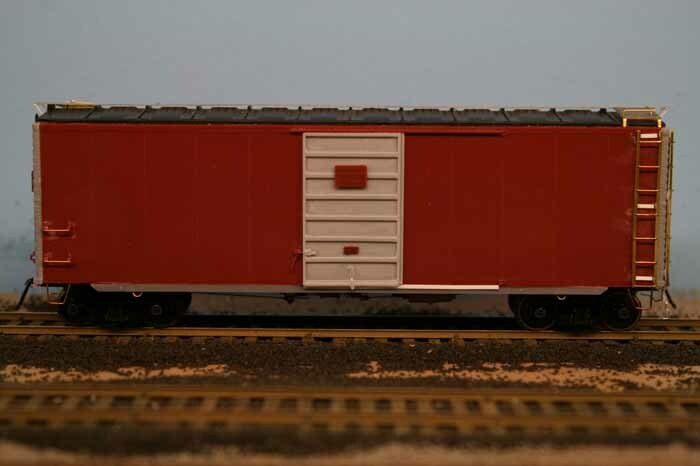 However, well know and renowned SP modeler and railroad historian, Tony Thompson, wrote about this is a recent blog posting on his blog, Modeling the SP. In essence Tony found a number of examples of this class of car that did receive AB brakes. The paperwork that Tony shares has the actual car numbers of those cars converted. All of this meant that I had to have a model of this car with AB brakes. I've developed an affinity for Automobile cars since I've started modeling the Wabash. As it turns out Tony wanted the same thing and hired me to build his model for him. We had no photos or diagrams from which to determine the component layout, but we felt that the basic arrangement would serve quite well. So away I went. A set of Tichy AB brake components, custom made brake levers and some trimmed turnbuckles for clevis' and we were in business. Tony prefers to decal and weather his cars himself, so I painted the car and sent it to him. His car is the top image. It's interesting to see the differences in our weathering styles. Both make for very nice models. And thanks again for the fine job building it!